College Board trustees on Wednesday named William Bynum as the next president of Jackson State University, despite opposition from some students and alumni. 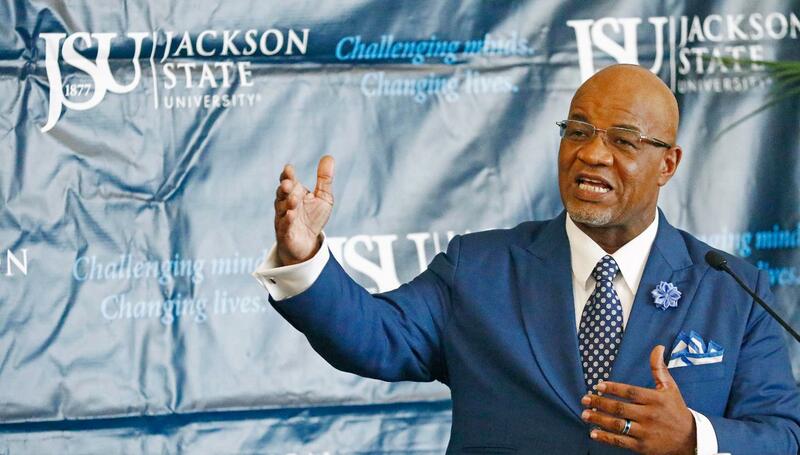 Bynum, now president of Mississippi Valley State University, said he can lead Jackson State out of financial difficulties. But detractors Wednesday questioned his choice by trustees because he wasn’t among three initial finalists. The eight university representatives who sat through interviews had all united behind a different candidate. A Hinds County judge did not rule on the lawsuit, which alleged that trustees treat the state’s three public historically black institutions more poorly than the five once all-white universities. Trustees, though, said it’s their job to name a president, and said Jackson State supporters shouldn’t be allowed to dictate outcomes. Trustee President C.D. Smith of Meridian, though, denied that the board was treating the 10,000-student university unfairly. “We’re impressed with his outstanding credentials, his strong record of accomplishments, and his thorough understanding of the challenges at the university,” Smith said. Former president Carolyn Meyers resigned last year, days after trustees intervened in Jackson State finances, citing dwindling cash reserves. Those problems are far from over, with Jackson State also announcing Wednesday that it will lay off 42 non-faculty employees, consolidate seven academic departments, and demote its School of Journalism and Media Studies to a department to save $2 million. University officials also said they may close a branch campus in a Madison office building and concentrate on offering classes at Holmes Community College in Ridgeland. Interim President Rod Paige already cut more than $4 million last fall when he eliminated 65 vacant positions and cut travel spending. Bynum repeatedly told campus groups Wednesday that the school is likely to face three to five years of austerity. “I don’t think that people really understand how tough things are and what’s going to happen in the next few years,” he said. Jackson State faces declining state and federal funding, plus a decline in funds from the Ayers anti-discrimination settlement that boosted money for Mississippi’s three public historically black universities. Bynum promised to consult with faculty, staff and students about plans at Jackson State. He said his goals include boosting enrollment, research dollars and graduation rates. He said that after the budget situation improves, he hopes to reduce faculty teaching loads, freeing up time for them to do more research. Bynum will start work in Jackson on July 1. College Board spokeswoman Caron Blanton said Bynum will get a fresh four-year contract. She said no salary has been agreed on yet. Bynum is making $225,000 at Mississippi Valley, while Meyers was making $270,500 a year at Jackson State. The board will now have to find a new president at 2,500-student Valley, and Bynum said he will recommend current Executive Vice President Jerryl Briggs. The focus Wednesday, though, was largely on anger with trustees. “While we question the motives of the board and the integrity of the process, we hope Dr. Bynum will be a catalyst for changing the relationship between Jackson State and the board,” alumna and retired employee Jean Frazier said at a news conference denouncing Bynum’s selection. Follow Jeff Amy at: http://twitter.com/jeffamy. Read his work at https://www.apnews.com/search/Jeff_Amy .